Shakespeare’s The Tempest is deeply embedded in the tropical landscape of the Mediterranean, so how does this play change when a modern adaptation is set in the Arctic? The play’s text addresses old world relations between Europe and Africa, as well as subtly nodding towards the budding relationship with the New World. The location of the play in the Mediterranean allows for an examination of many aspects of colonialism. 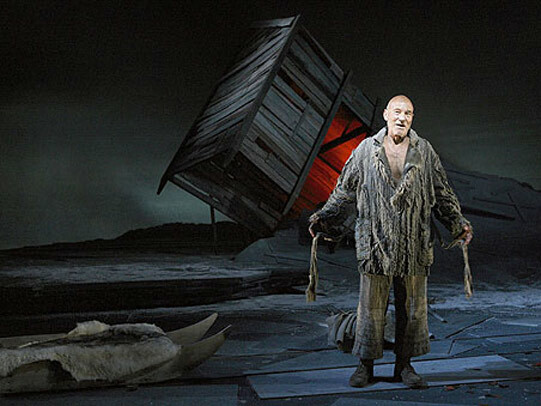 The Royal Shakespeare Company and Goold, in 2006, set the play in the Arctic; this new location allows for an examination of a different kind of colonialism and has a pervasive impact on other aspects of the play. The setting of the Arctic drastically changed how the play is situated in the world. Quarmby, an expert in Shakespeare at King’s College, noted that the starkly different set was immediately apparent, “[not] the traditionally fanciful tropical dystopia but to a frozen wasteland, blasted by blizzards and peopled by the indigenous Eskimos, elephant seal and Arctic sprites.” Quarmby asserts that the setting of the Arctic allows for a dramatically different performance of the play, that manifests in the portrayal of characters and other directorial choices. One compelling change was the “snail-like pace” that conveyed the “monotony of existence and the perpetual wind and snow….” This pacing would not have been appropriate for an island teeming with wild life and mercurial weather, but in a barren landscape like the Arctic the option to slow the play to tedium is consistent with the environment. Additionally the environment changes the colonial implications of the play; the culture of the Arctic is distinct from that of rest of the Americas and has a very different history of colonization. The Duke’s arrival on the Island, taking it from Caliban and Sycorax, and ‘civilizing’ it, is consistent with the colonization of Arctic land, but the enslavement of Eskimo people is not strictly historically accurate so there is less of a historical context to character’s such as Caliban in this location. The characterization of Prospero is also drastically different than what is common for the play when it is set in the Mediterranean. When the play is set in a tropical landscape Prospero learns about the island from Caliban, and there is little indication that living there is arduous, even if it is not as comfortable as his Milanese past. In Shakespeare’s setting, Prospero is traditionally portrayed as a “usurped and aged pet-duke, melodiously bewailing his lot and manipulation circumstances….” This is distinctly different from how Prospero appears in Goold’s production, as a man whose “experiences and survival instinct have hardened him” and made him more rugged. In congruence with the Eskimo culture, Goold’s Prospero employs very different magic, “meaner…sharper…” and associated with “…cold and calculated imperialism.” The nature of Prospero’s magic is different as a function of Arctic culture, and this is doubly true for the portrayal of Ariel. The character of Ariel is deeply influenced by the tropical setting of Shakespeare’s play, and is therefore drastically changed in Goold’s choice of the Arctic. Quarmby states that Ariel is traditionally “associated with wisp like androgyny” and played as a fairy. However the Eskimo tradition does not lend itself to this characterization. In Goold’s production Ariel “glides ominously across the stage” and employs “withering looks worthy of the great Mesmer himself.” The images of Ariel, show the eery, ghost-like quality of Ariel in this production. One particularly disparate feature of the play was that Caliban was “no match for the malignant sprite Ariel;” Caliban paling in comparison to Ariel is oddly contrasted with how Caliban is normally portrayed. The transformation of this play to accommodate the Arctic environment allowed for different elements of Shakespeare’s characters to be emphasized, but there were ways in which this adaptation fell short of Shakespeare’s original. Quarmby admits that for Caliban “ the change of focus and location are a hindrance;” Caliban’s character does not translate well to the Arctic setting, which may be because in Goold’s performance, every actor is white. Theoretically the characters of Ariel and Caliban are Inuit people but they are played by white actors, and the issue of race that was originally being addressed must necessarily be less poignant. The issue of colonialism is inherently tied with race relations, and to try to portray colonialism involving only white people removes a layer of the complexity. This entry was posted in Performance and tagged Arctic, Royal Shakespeare Company, The Tempest on August 20, 2015 by .